You might have tried cheese and minced meat with spaghetti. You might also have tried nuts with minced meat. But have you ever tried a blend of minced meat, nuts and cheese? I am sure, not! 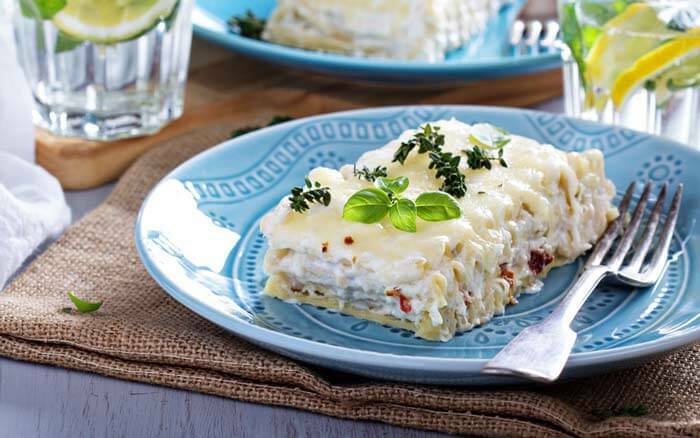 Lasagna is liked by people all over the world. It is mostly made with tomato sauce but I will be making it with white sauce. White sauce gives it a unique cheesy flavor which is quite different from the tomato sauce. Let’s roast the almonds first. Grease a baking tray, place almonds in it and bake for five minutes. The oven temperature should be 350 degrees. Let the almonds cool down and then crush them. Don’t make them very small. Boil water in a large skillet. Add 1 tablespoon oil and a pinch of salt. Put in the Lasagna noodles and boil for 90 seconds. Take them out of water and spread in a dish. Grease them with a little oil if you feel like they will stick with the tray. I am using beef for my dish. You can use whatever you like (mutton, lamb meat or pork). Grind the meat in the meat grinder. You can also use a meat processor. It also gives you a good textured meat. Melt butter in a pan, add chopped onion and fry. Let the onion be golden brown. Next, put in the ground meat and add salt, nutmeg, pepper, cinnamon and cloves. Cook till the meat is no longer pink and the water in it has dried out. Till the meat gets cooked, let’s make sauce. Melt butter in a large saucepan. Put flour in it and cook. Add salt and pepper and blend well. Add milk slowly and bring to boil. Cook for a minute more and let it become thick. Remove from flame and add 1/3rd cup cheese in it. Mix well. Remove cooked mince meat from heat and dish out. Add roasted and crushed almonds and fresh parsley and mix. Place four Lasagna noodles in a baking tray. Spread cooked minced meat over it. Spread 1/3rd cup cheese over it. Place another layer of four Lasagna noodles above it. Again, spread minced meat over it. Pour white sauce above it. Spread the remaining cheese at the top. Bake for 25 minutes in a preheated oven.